My 2010 flew by, with very little sewing done. And almost nothing completed. So I have have a new resolve for 2011. I am going to sew! I've cleaned the sewing room out so I can at least get into the room, bought a new sewing table for my machine, and am ready to sew. 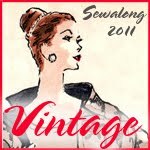 So this is a great time to sign up for the 2011 Vintage Sew Along - January is pattern selection and muslin, February is make and share. I've got scads of vintage patterns I'd like to try. Two little elves and a pixie came to live with us.